A collection of Christmas cards dating back to 1905 are on display at Memorial University’s Queen Elizabeth II Library. Linda White, an archivist for the library’s Archives and Special Collections, spoke with The Racket via email about this collection, and how they ended up at MUN. The cards were found in Kean’s Shop, located in Brookfield, Bonavista Bay during renovations by the building’s present owner Janet Davis. The shop had previously been owned and operated by Captain Job Kean and his wife Virtue Hann and was built in 1890. Kean’s Shop operated as a sort of “one-stop shop” and sold everything from “a needle to an anchor”. Job Kean was a busy man and operated several businesses, owned eight vessels and mastered several ships during the seal hunt in winter. Newfoundland history buffs may know of Kean’s more famous uncle, Captain Abraham Kean, who is considered the most successful sealing captain in Newfoundland’s history. This card is from 1912 and sent to Mr. and Mrs. Kean from J.C Crosbie in St John’s. JC Crosbie was John Crosbie – grandfather John Crosbie and great-grandfather to Ches Crosbie. As time passed, Kean’s business influence gradually waned but the shop remained in the family before closing in the 1970s. The building would fall into a state of disrepair but due to its unique style and location to what White called a “stunning view of the surrounding area,” Kean’s Shop became a Registered Heritage Structure in June 1998. It was around this time that the cards were discovered. Janet Davis and Duke Kelloway became the new owners of the Kean premises along with items included with the house. 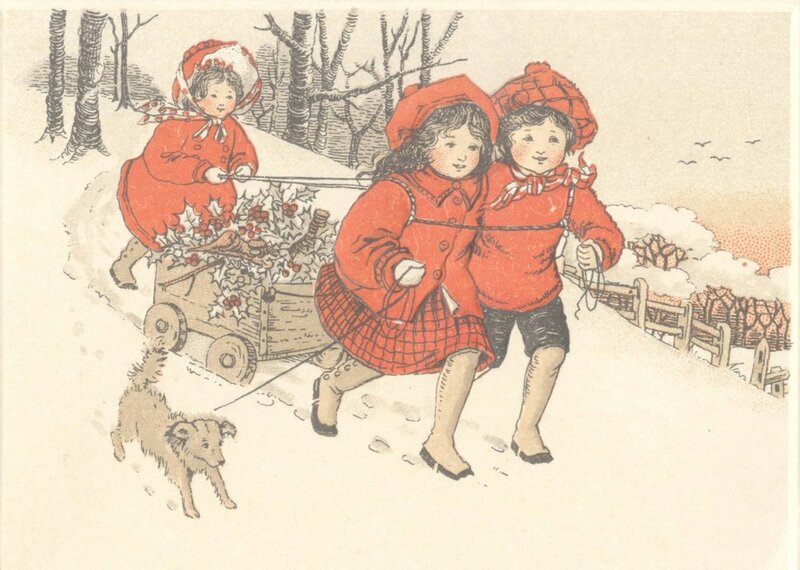 Among them was a collection of hundreds of Christmas cards dating from 1905 to 1926. The cards are similar to the ones we see today but White said most of them are smaller, and average about 3 inches wide. According to White, the cards use a lot of colours that we don’t traditionally associate with Christmas such as purples and blues. If you would like to view this collection, you can visit the Queen Elizabeth II Library at Memorial University. “Everyone is welcome,” said White. If you aren’t located in St. John’s, or simply can’t make it to the library, the cards have all been scanned and are available online. White, who told us still sends Christmas cards to those not on her email list, considering this card to be one of her favourites.